Flattening the Global Innovation Landscape — Part III: What is next? Constructing the landing platform for foreign entrepreneurs in Silicon Valley — From dream to reality! The pain: Young ventures born in emerging countries lack access to the enabling and proven processes that will increase the probability of scaling-up quickly successfully. This is due to the lack of maturity of their own ecosystems and the barriers to entry or limited access to a network of peer innovation ecosystems around the world. 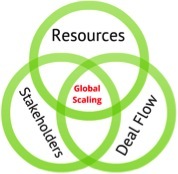 The objective is to provide efficient global scaling mechanisms to enable those ventures possessed of the “right stuff”: a team of entrepreneurs, a value proposition, investors, huge potential markets, etc., to reach their full potential globally. Implicit in this problem statement is that the Innovation & Entrepreneurial (I&E) fever will continue in Latin America and is not a passing fad. In addition it is expected that the global commodity boom will continue providing the resources to support the development of local entrepreneurial ecosystems. Implicit is also a hope that within a finite amount of time there will be a number of success stories from local entrepreneurs and investors who will become “rock stars” and regional role models, sustaining and adding fuel-to-the-fire of the I&E fever. The opportunity: Create an efficient “landing experience” for entrepreneurs from emerging world regions to increase the odds of their success in the global scaling of their ventures. Implicit in the development of this landing platform is the creation of economic value for all the stakeholders involved in this activity. Equally important is the development of an intangible value or “mystique” of the landing platform, through the formation of a community and its culture, customs and bridges forged between Latin America and Silicon Valley. Proven products and services with paying customers. The activity of this proposed platform hinges on the local angel groups and/or VCs. These organizations are sprouting up across Latin America and are taking multiple forms (i.e., local accelerators, angel groups, leveraged VC funds, public/private partnerships sponsored by economic development agencies, etc. ), as they have adapted the best practices from the US, Israel, and other advanced entrepreneurial ecosystems from around the world to their local reality. The local angels and VCs are fundamental because they have elected to place their investments in a selected group of portfolio companies from a large number of start-ups from the local ecosystem. Local angel groups and VCs make investment decisions from the pool of local companies based on their investment philosophy, management experience, track record, area of expertise, etc. Typically the local angels or VCs are successful business executives and entrepreneurs who are most likely philosophically grounded in the “old” economy paradigm but nonetheless tempted to participate in the new wave of internet and mobile platform ventures. They are the pioneers in the ecosystem participating in an activity that at large did not exist 5 to 10 years ago. They are risking their own money as well as the funds of other business associates who have been persuaded to participate. In many respects they are learning how to become an angel or VC investor in the incipient industry of risk capital. A good deal of their prior experiences will apply however many of the rules of the old (atom/physical) economy do not. Furthermore, they bring with them a number of “bad habits” since historically they have benefited from information and access asymmetries, which in many of the advancing Latin economies are being eliminated due to an increase of transparency and rule of law. As portfolio companies are selected from many local funds (Angels/VCs) a number of key questions are triggered: where, when, how, how long, cost, etc. An equal set of questions are also triggered of a more personal nature affecting the daily life of the foreign entrepreneur(s) emerging from the possible relocation. Community of which the Landing Platform is located. As the Landing Platform is designed, the expectations of the five stakeholders are at its center. Interests must be aligned and centered with the success of the start-ups scaling globally quickly and efficiently. The success criteria could be different for each company: increased sales, wider markets, increased profitability, patent protected technologies, sufficient funding, excellent advisors, etc. Great success will lead to the creation of extraordinary economic value to the benefit of all stakeholders. The Stakeholders: each one has unique set of needs and should be matched against clear expectations. Five key stakeholders are identified: the Latin entrepreneurs, the Latin investors, the US/Bay Area based investors, the Landing Platform and the surrounding Community. Some of the resources made available to the entrepreneurs are: The Landing Platform is the place where the resources are available just-in-time as required, and the advice is provided to empower the entrepreneur throughout the initial steps and beyond. To be effective, this resource delivery needs to strike the right balance of supporting while leaving the entrepreneur in charge, and in the process developing a sense of community with shared responsibilities and accountability as well as shared benefits. At the core the platform should retain its Darwinian character and never intends to create a process that could guarantee the success of most. However, foreign entrepreneurs have embarked in a very demanding personal and professional journey, which is hard enough and it should be not made any harder! Business Formation Foreign incorporation, capitalization table, accounting, banking, governance, etc. Venture Acceleration Marketing, competitors, business development and intelligence, intellectual property, etc. Communication and Connectivity Networking, events directory, connecting with peers, community of learners, etc. Partnership Development Distribution, technology, market development, funding, etc. Community Formation Events, community calendar, activities and services scheduling, network/printer, etc. Personal Housing, immigration, Bay Area navigation, gym, wellness, etc. Having covered the first two services of the landing platform, the hosting space and the resources made available and the companion “light” services; now we need to ask for what purpose? It is clear that the ultimate goal is the creation of the highest possible valuation. This success can come from different sources based on the current or expected future performance of the venture. A great entrepreneurial management team complemented with a unique technology, supported by an innovative business model and large addressable markets constitute the fundamental elements to fuel an exponential valuation. However, the story has to be well told (pitched) to the relevant audiences. So who is this relevant audience? The output of the landing platform needs to connect with corporations and VCs who are interested in a unique deal flow of Latin ventures who have succeeded through two selection funnels (the local and the global scaling funnels) and are ready to go through a third one. The expected benefit of the cascade of these three funnels is a higher yield and geographical diversity to enable finding the “right” Chilean or Colombian start-up in a very cost and time efficient manner. The Landing Platform provides hosting facilities to the various stakeholders, makes resources available empowering entrepreneurs with the needed knowledge for the quest of scaling-up their ventures. Furthermore, it provides the opportunity for those successful ventures to pitch to corporate investors, large global customers and key technology or market partners. Which of these two scenarios would I pick? It was a disarming question because of its simplicity and yet I had never before dichotomized the two scenarios in my mind. While he was picking up the tab, I paused to reflect and thanked him for the question and its timing (and lunch), and promised Elton to develop the answer in this up-coming post. The proposed structure enables both, since most of this posting has been devoted in how the landing platform will enable a soft landing of Latin American start-ups here in the Bay Area, it will create a flow of knowledge in the opposite direction enabling Bay Area investors to connect with foreign peers and their portfolio companies enabling the scaling of the SV born companies to explore growth opportunities in the Latin American markets. And so my answer is, why choose? The Landing Platform can support global scaling in both directions, creating a win-win north/south partnership. It is all about connecting quality individuals with aligned interests: let the music happen, “and the sounds will take care of themselves“ (from Alice in Wonderland). Until my next blog-post amigos! – Carlos B.
 Spain and Portugal are added to the Latin America geography. The focus in the Spanish and Portuguese speaking countries in the world is retained; bringing together their cultural affinity, shared values and historical roots. 2 Responses to Flattening the Global Innovation Landscape — Part III: What is next? Another thought provoking post. I think this new business venture is a great idea and while there are many hurdles, will be a big success when you pull it off. Separately, I use Google reader to consolidate the blogs I read regularly, and it would be convenient to add yours to it so I don’t miss it in my email. Can you ask Gina to enable RSS feed subscription on your blog? She would just need to install a widget on WordPress. I can explain how if she wants to contact me. Thanks for having the consideration of adding us to Latin America :-). Times have changed, definitely. Before, in Spain we used to think about South America almost as an extension of Spain. Now we can be thankful for allowing us to be part of it. However, excellent post with a great deal of opportunities.